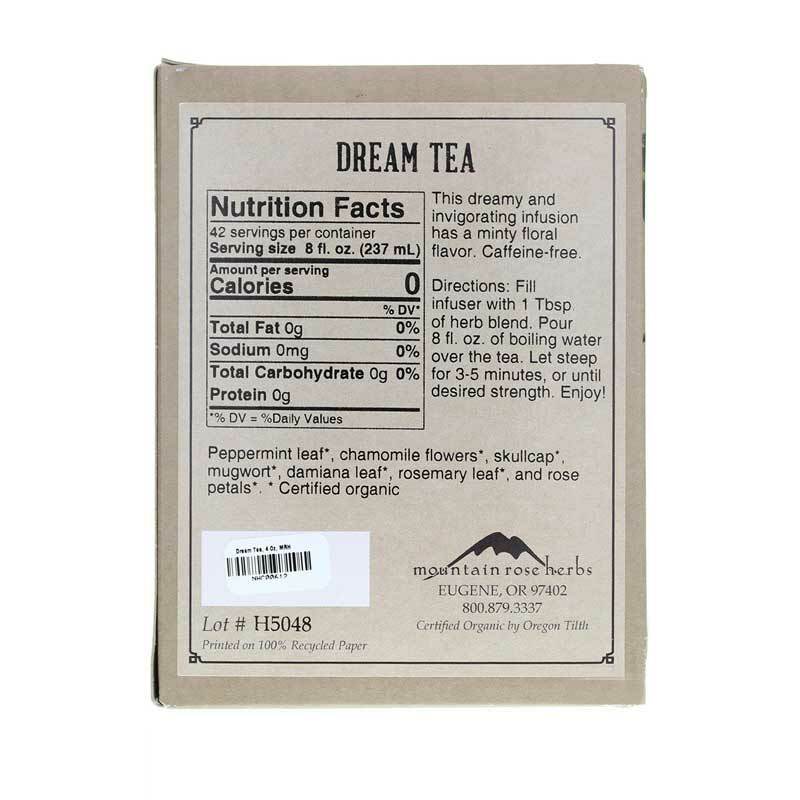 Certified Organic Dream Tea by Mountain Rose Herbs is a loose leaf herbal tea blend based on an ancient formula said to evoke powerful and colorful dreams. Dream is especially blended for the dreamer, stimulating vivid and easily recalled dreams. Especially blended for the dreamer, stimulating vivid and easily recalled dreams. A light, minty yet, rich flavor. Very enjoyable after a rich or large dinner. Unlike traditional tea bags, Mountain Rose Herbs loose leaf herbal tea is fresh, fragrant, tasty, longer lasting, and far more economical. Their passion for artisan quality tea is evident in every batch of their handcrafted tea which was lovingly crafted in Eugene, Oregon. 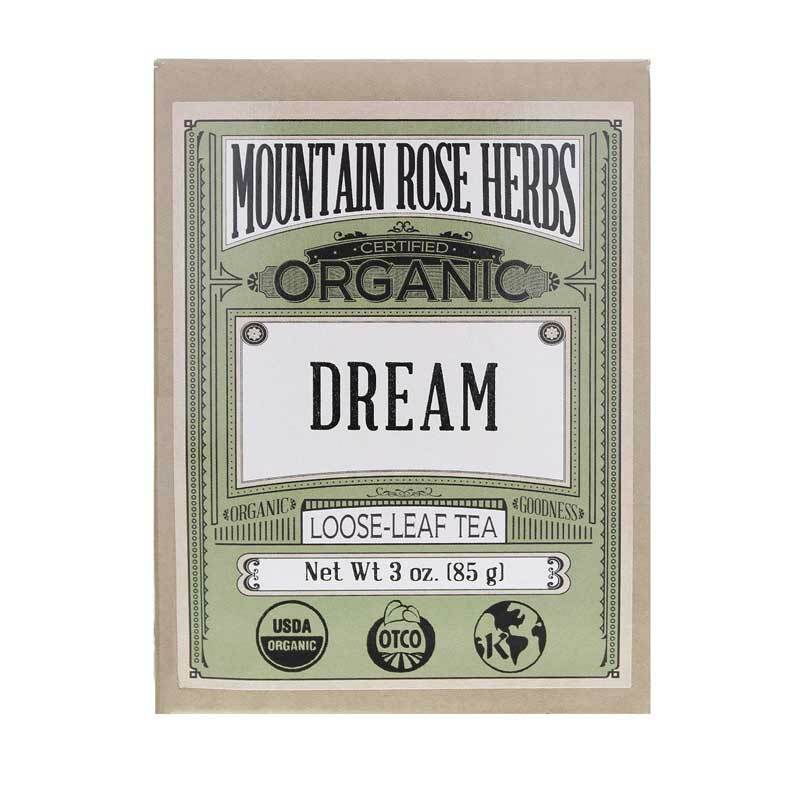 All of Mountain Rose Herbs herbal teas are made using certified organic ingredients which provides for a superior cup that is unrivaled in taste, color, depth and aroma. To get the most of the essential properties the leaf and flower blends offer us, infuse them by taking 1 teaspoon herb to 1 cup of boiled water, pour the water over the herbs, cover tightly; seep for 5 to 15 minutes, strain, and enjoy. I was looking for some new teas that that were decaffeinated and a good substitute for coffee during the day.The chocolateTeeccino tea is good with milk and sugar.